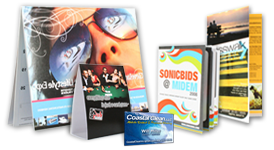 Large Format Printing, Business Cards, Posters & More! Turn your favorite photos into a work of art! Custom Vinyl Graphics Available in Over 60 Colors! 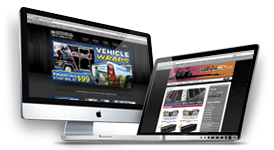 Basic Sites, Custom Programming to e-Commerce, We Do it All! Big or Small, We've Got You Covered! 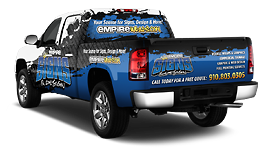 Empire Graphics specializes in a full range of graphic options for your car, truck, fleet vehicles, boat, trailer or just about anything else you can think of! We can accommodate any budget, from large corporations to small businesses. Empire Graphics can handle all of your commercial printing needs. From Business Cards to Presentation Folders, Posters to Calendars, we’ve got you covered! We know how important sticking to a budget is in today’s economy that’s why we strive to give our customers the most “bang for the buck” possible while still producing top quality, award winning designs. Empire Graphics is Your Source for Signs, Design & More! Whether you need a basic yard sign or a full corporate identity package we can help you get your message out to new potential customers and get you noticed!